Looking for CDS exam previous question papers of English? Combined Defence Services Examination II 2012 was held on 16th September 2012. Check out the CDS Exam II 2012 English question paper here. Combined Defence Services Examination II 2012 notification was released on 02nd June 2012 by UPSC. Online applications were accepted by UPSC up to 02nd July 2012. All candidates who have filled up online CDSE forms correctly issued with the admit cards. CDS exam 2012 was conducted on 16 September 2012. Here we have provided CDS Exam II 2012 English question paper. This previous year question paper can be downloaded by all candidates for free of cost. We suggest all candidates who are about to appear in Combined Defence Services Examination to go through this CDSE previous year question paper to have some idea on the pattern and difficulty level. 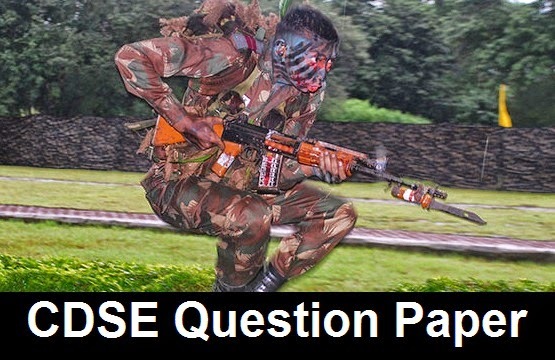 Key of CDSE II 2012 English question paper has not yet released by UPSC. Also we recommend all students to go through CDSE Exam II General Knowledge question paper.